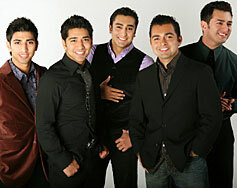 The five Gutierrez brothers, who make up GB5, have all the harmonious symmetry of a modern day Jackson family and a unique musical stance-best described as Latin-pop Praise-that shatters the rote formula of Christian music today. Yet when you hear their voices blend or watch them perform, you know that the distinctive sonic flavor is as natural as the rolling sea. Natural is also a good way to describe the band's beginnings. Growing up in San Jose, California, Louie, Jamie, Isaac, Mark and Aaron never considered combining their talents (other than singing around the house) until approached by the pastor of their home church to lead their congregation in a song. They decided to give it a try and, without any specific intentions, that one song became the spark that lit their musical journey. The worshipers who took part that evening were amazed, and very quickly, the brothers were accepting invitations to share their music at various festivals, churches, conferences and concerts across the country. The simple desire of GB5 is to use their gifts to bless others and lead people into the presence of God. Yet, garnering comparisons to well-known groups like 4Him and Salvador, it seemed that the amount of people that they would lead was much larger than they originally imagined. In 2004 the brothers' vocal abilities were featured on the Spanish version of Maranatha! Music's best-selling Top 25 series, Top 25 Alabanzas Para Hoy (Praises for Today), which made it to the number 1 spot on the Christian Latin music charts. With that endeavor, it was clear that their musical talents coupled with their bilingual abilities gave GB5 a depth of range rarely encountered in Christian music. Soon, it only made sense for the brothers to begin work on their own album where their passion for singing and leading others in song would find a wider audience. And there were plenty of acclaimed producers and Christian musicians who heartily agreed. It wasn't long before they signed with producer Phil Sillas on a new label called TSG Records. On their eponymous debut, distributed by Spring Hill Worship (Word Dist), a combination of GB5's unique style, musical strength and genuine attitudes attracted such acclaimed industry leaders as Jonathan Butler (who wrote and produced four songs and appears on one), Alberto Salas (Carlos Santana, Los Lobos, Poncho Sanchez), Rex Rideout (Luther Vandross, Angie Stone, Will Downing), Jason White (Helen Baylor, Kurt Carr, Judith McAllister), and Phil Sillas (Plus One, Natalie Grant, Promise Keepers). Also appearing on the release is the celebrated vocalist TataVega. However, the strength of the album is the way it captures the vibrant Latin-pop style of GB5 and infuses it with jazz and urban tones throughout. One of the album's highlights includes the only completely Spanish track of the release, "Te Alabo." On it GB5 proclaims that with their hands, with their feet, with their hearts and souls they will praise God's name. It's an appropriate maxim for the band. It is what they intend to accomplish with their music and their lives, and it's only natural that anyone listening will join the praise that GB5 is offering up.